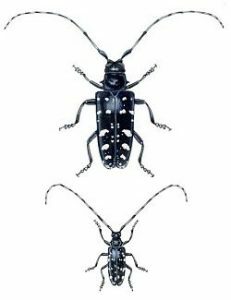 The Indiana DNR has reissued a watch for the Asian Longhorn Beetle (ALB), a 1 ½ inch long beetle that looks like it escaped from a science fiction movie. 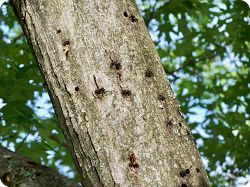 Sporting random white spots on its black body and antennae, this invasive threat previously quarantined in areas of Clermont County, OH, has now been found in East Fork State Park, and thousands of trees – infected or not – are being intentionally destroyed. A 61 sq. mile area in Clermont Co. has already been cut down in the original control area. Why are healthy trees removed? Because there is no way to check every branch on every tree for evidence of the ALB. This weird beetle does not migrate far in a season, but it is a major threat to landscaping, woodlands, parks, and logging operations because it affects at least 11 different species of trees including ash, elm, birch, poplar, sycamore, willow, hackberry, horse chestnut, mimosa, and its favorite host — maple. Look at this list – these trees make up over 75% of the trees in HVL! Never, ever, ever bring firewood into HVL from anywhere! You can get as much free firewood as you need by contacting the POA Office – lots of ash trees have been cut down and are available for the taking. If you do spot signs or one of these alien invaders, contact Linda.